Stephen Trombley's A History of Western Thought, outlines the 2,500-year history of European ideas from the philosophers of Classical Antiquity to the thinkers of today. 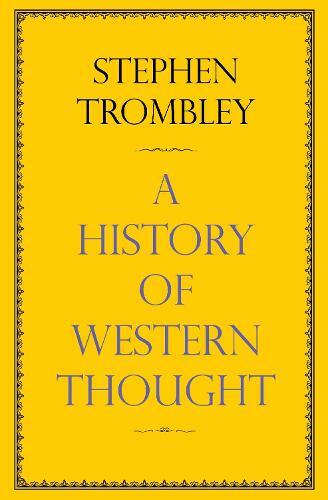 No major representative of any significant strand of Western thought escapes Trombley's attention: the Christian Scholastic theologians of the Middle Ages, the great philosophers of the Enlightenment, the German idealists from Kant to Hegel; the utilitarians Bentham and Mill; the transcendentalists Emerson and Thoreau; Kierkegaard and the existentialists; the analytic philosophers Russell, Moore, Whitehead and Wittgenstein; and - last but not least - the four shapers-in-chief of our modern world: Karl Marx, Charles Darwin, Sigmund Freud and Albert Einstein. A History of Western Thought is a masterly distillation of two-and-a-half millennia of intellectual history, and a readable and entertaining crash course in Western philosophy.